The pearl of entrepreneurship is a spark of irritation that creates a gem of an idea in business. Is it learned, taught or is it an evolution of experiences? 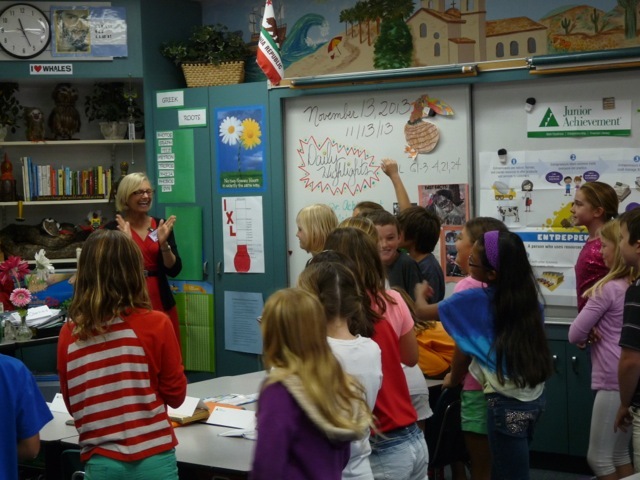 Standing in front of classroom of fourth grade students in San Diego, Californi, Claudia Laird Obertreis, a business leader volunteer for Junior Achievement, introduces basic business concepts to students who any other time of the day may be playing games or videos on a mobile device. An entrepreneur herself, Obertreis teaches abstracts in Region and Resources explaining” human, natural and capital resources to offer products or services to customers”. Each session has a creative group activity where students have a chance to exchange ideas and collaborate. Obertreis shares that she has been influenced by Ray Rubio of Rubio’s Fish Tacos, Judi Sheppard Missett of Jazzercise, Marilyn Nelson Carlson of Carlson Travel for their entrepreneurial successes. The reality is being an entrepreneur is a high risk venture and most people will enter a more traditional form of employment. Yet, by learning business basics along with creativity, problem solving and collaboration these fourth grade students in Obertreis’ class are future pearls in society and will have an advantage in their life’s pursuits by thinking and acting like an entrepreneur. Tags: California, Carlson Travel, Claudia Laird Obertreis, Claudia Laird Obetreis, Claudia Obertreis, Entrepreneur, entrepreneurial, Entrepreneurs, entrepreneurship, Jazzercise, Judi Sheppard Missett, Junior Achievement, Marilyn Nelson Carlson, Obertreis, Pearls Series, Ray Rubio, Region and Resources, Rubio's Fish Tacos, San Diego. Bookmark the permalink. Previous post ← Privatization of Cultural Heritage?